As you continue along your crystal journey, you have probably come across some crystals at one time or another that were created in a lab or treated in some way. At first you may have been surprised, but after looking into it further you may have discovered that there are many stones and crystals that have been altered from their natural state. While this is often done to enhance the appearance of the crystal, you may have been wondering what effect, if any, this will have on the energy it emits and on how it is used for healing. One of the most common ways that crystals are modified is their color. Some crystals are dyed to produce an unnatural color in the crystal, such as pink, royal blue and teal, which is usually seen in Agate or Quartz. These are the most obvious to appear that their color has been altered. Other color changes in the crystals are not so apparent. Lapis Lazuli is often dyed blue to make the color more consistent. This also applies to most Black Onyx, which naturally tends to have gray streaks and is dyed black. Turquenite is the name given to white Howlite that has been dyed a turquoise blue. Faceted gemstones are also commonly colored to make them more visually appealing. Some other commonly dyed crystals are Malachite, Rhodonite, Jasper, Turquoise, Agate and Aventurine. These color-altered crystals still retain the healing qualities of the original crystal, but will also take on the healing properties of the new color it has become. 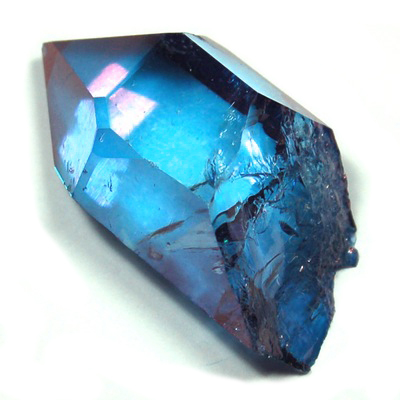 Another way the color of a crystal can be modified is by either heat-treating them or by irradiation. Irradiation is done by exposing the crystal to gamma radiation, neutron bombardment or ionization and is used to make Smokey Quartz a consistent dark brown color. Heat treated crystals are heated with chemicals to alter the coloring of the crystal. A lot of Citrine available on the market is actually heat treated Amethyst. You can easily identify these Citrine crystals by their bright, golden yellow coloring in comparison to the pale yellow or greenish yellow of natural Citrine. Red Tiger Eye is created by heating Golden Tiger Eye. Some other commonly heated crystals are Tanzanite, Tourmaline, Fluorite, Aquamarine and Amethyst. Heated and irradiated crystals also still retain their inherent healing properties. If the crystal changes color during the process, it will also adopt the properties of the new color, which can be used in color therapy and when working with the Chakras. Another method of changing the color of crystals in a lab is by super-heating the crystals and then infusing the surface with vaporized metals that create a permanent coloration on the surface of the crystal. This process is used to convert Clear Quartz into Aura Quartz including Aqua Aura, Indigo Aura, Tangerine Aura, Angel Aura and Champagne Aura. The color of the crystal is determined by the metal(s) used. This process of enhancing crystals not only combines the metaphysical properties of the metal with Clear Quartz to create high vibrational healing crystals, but the Aura Quartz also has unique healing properties of its own. Crystals that typically have cracks and fissures on their surface in their natural form are sometimes filled to enhance the appearance. This is done by adding wax, glass or another substance to the crystal to fill in the imperfections and create a smoother surface. Some crystals that have been modified this way before are Sapphire, Ruby and Emerald. Filling crystals only changes the look and color. The healing properties of filled crystals are the same as before the modification. Other crystals are entirely created in a lab. Bismuth is one example of a man-made crystal that is created in a laboratory from a mineral and “grown” into a complex rhombohedral crystal structure that has a beautiful rainbow of colors. Goldstone is a combination of glass and metal flakes, which both impact the healing properties of the stone. The type of metal/mineral used determines the color of the Goldstone: red is from copper, blue is from cobalt, green is from chromium oxide, and purple is from manganese. Both Goldstone and Bismuth are powerful and helpful healing crystals, despite the fact that they are man-made. Bismuth can assist with feelings of isolation and can help you through a transformation. Goldstone is a stone of ambition and can help you to achieve your goals. Goldstone also stabilizes the emotions and can be useful for arthritis pain. Crystal healing is a great way to connect with all the Earth’s energies and her amazing crystal creations. It’s important not to overlook the heated, treated and man-made crystal companions too, even though they have been modified. While not all crystals are sold in their beautiful natural state, these lab enhanced crystals have a place in the world of crystal healing and are useful additions to your “crystal toolbox”.